It is important for anyone concerned about their animal’s health to consult a Vet. However, The British Royal College of Veterinary Surgeons accepts contact and distance healing for animals and does not insist that an animal is seen by a Vet before healing is given. Healing and veterinary practises and medication often work very well together. Christine Nobel is a Member of the International Institute for Animal Care Education and has good training and experience in animal care. Her Intuitive Healing by telephone often helps animals. 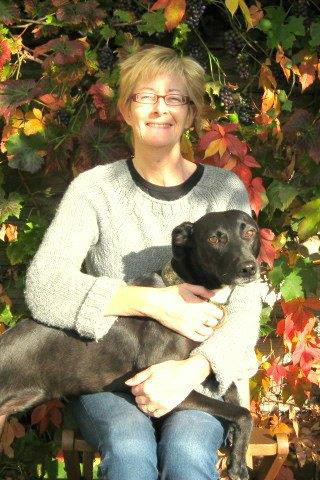 Christine works mainly with horses, dogs and cats but she is happy to treat other animals too. Animals can be given healing from a distance by telephone via their owners. After a year of following medications from 4 different Vets my cat was just getting worse. His fungal skin infection was spreading and half of his body was bald. After a single phone session with Christine I began to see improvements within days. It is now 3 months later and my cat is full of energy, eating well and his skin infection is 99% better. A very big thank you to Christine for her wonderful animal healing from a very grateful cat owner. “I found Christine Nobel online when my cat Lucy had black gunck and a bad smell coming out of her ear for about 9 months and we couldn’t find out what was wrong with her. We had to clean the ear out almost every day despite her being on a mainly raw meat diet and having perfect health and amazingly beautiful red fur. I live in New Zealand so Christine called me on the phone at an allotted time. Within a few minutes Christine identified the problem and applied her healing technique. Within a few days I noticed significant improvement. Within a week the smell had completely gone and there was no more gunck coming out of Lucy’s ear. For prices for animal healing by telephone please see Consultations. My poor pony had been written off by Vets. They said the issues were too complicated. He had gone from being a happy, healthy pony to being depressed and in pain. Christine‘s healing has helped him more than words can say. He trusted her and after her healing treatments he is happy again, no longer in pain and no longer depressed. I am so pleased that I met her. 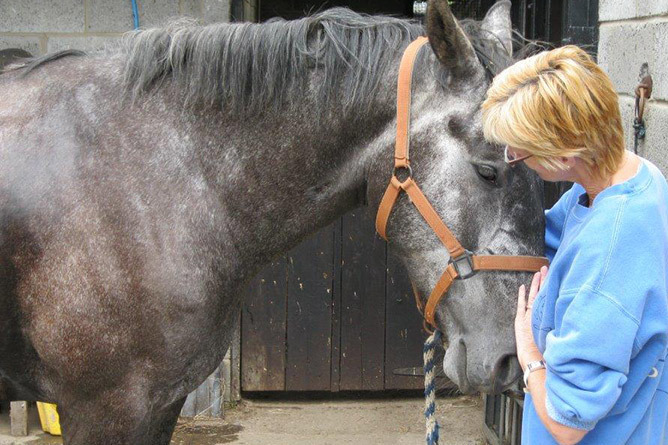 Christine Nobel has a Diploma in Equine Care & Psychology (Lingfield) and is a specialist in Horse Healing. She has had a close bond with horses all her life and has treated horses of a wide variety of breeds, backgrounds and training disciplines over a 15 year period. Christine can help horses either in person, or from a distance by telephone via their owners. Christine can make personal visits to horses based in Herefordshire or the surrounding counties. Christine’s effective formula is to relax the horse deeply with channelled healing whilst communicating with him telepathically and strengthening him with Intuitive Healing transformations. She can often communicate directly with a horse and understand what the horse is trying to say. Christine putting a horse into a deep healing sleep. My 10 year old driving cob suffers sacroiliac back problems. The effect Christine has on him is amazing. The moment he hears her voice he goes into a deep sleep, as if he has been heavily sedated. After a few of her treatments I had a completely different horse. He was much happier. Christine is an incredible horse psychologist and healer who can hear what the horse has to say. In my Horse Rescue Centre I have seen her calm a completely petrified horse in minutes where it might otherwise have taken me days. We can work together on a traumatised horse and come out with a totally different animal. My Horse Rescue Centre has rescued and re-homed over 1,000 horses. Christine is one of the few people I ask to work on my horses and, I believe, the only person who can get the results that she does. Roy Moore – Proprietor of KC Horse Rescue Centre, Herefordshire – Professional Horse Breeder, Trainer and Carriage Driver. 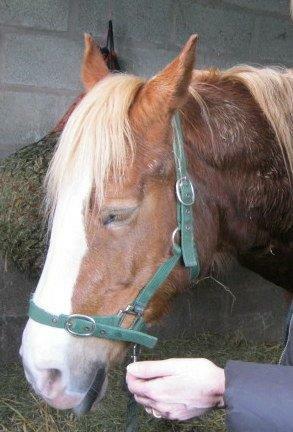 It is possible for Christine to visit horses in Herefordshire or the surrounding counties. For each additional horse treated during a visit an extra £25 is charged. Extra mileage will be charged for distances greater than 15 miles. This will be calculated and quoted prior to a visit. It is possible for Christine to visit a yard or an area in Herefordshire and surrounding counties and to give healing treatment to a number of horses of various owners. Christine can give one overall quote for the visit to be shared out amongst the owners. To find out more, email Christine Nobel to arrange your free 5 minute phone call. Christine can call back on most landlines worldwide and on some mobile phones. If you have concerns about your health or your animal’s health you should first consult a Doctor or a Vet. © 2019 Intuitive Healing Worldwide. All Rights Reserved.